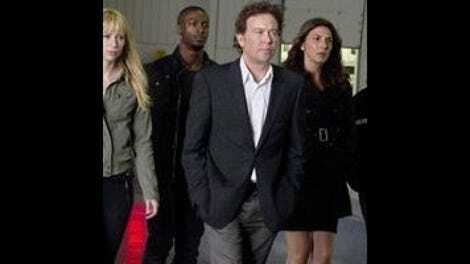 Leverage: "The 15 Minutes Job"
Tonight's episode begins in the offices of Reed Rockwell, a professional shaper of public opinion and master of media and image manipulation who destroys the lives and careers of the useful and blameless by weaving the taint of scandal around their names. His first line, spoken to his hulking assistant, was, "Any trouble planting the evidence, Mr. Crease?" This seemed to pretty well establish Rockwell's standing as an ethically challenged sort who is not above doctoring the evidence against those he targets. Mr. Crease thought he might be on a dry run with his current campaign against the State's Attorney, a solid public citizen who, like Tracy Jordan since he did that Oscar-bait movie, is so beloved that he can do no wrong. Rockwell broke it down for him. "Our friend the state's attorney is clean now," he said, while pulling up a photo of his target and adding some red to the eyeballs. "But he did this stint in juvenile detention and another in drug rehab. All we have to do is plan t a whiff of scandal, and media follows the trail all the way back to those old sins." And the public? "The public has been lied to, Mr. Crease. Told all their lives that they can have the good life. But no ever gets it. Every year they work a little longer, and their houses are worth a little less, and their retirement fund gets a little smaller. And when the public gets upset, they look around for someone to blame. Someone to take down." I go to the trouble of setting all this down here for posterity because I have a soft spot for speeches that really cry out to end with the speaker throwing back his head and laughing, "MWAH-hah-hah-hah!!" Even with all the bad TV I watch, I haven't come across a doozy like that one since Rumsfeld's book tour. What made it even better than it reads on the page is that Rockwell, the malign publicity wizard, was played by Michael Gladis, who used to play the sniffy, baby-faced liberal on Mad Men. So if you were of a mind to, you could imagine that he was demonstrating the extent to which being snubbed by Don Draper and Bert Cooper could lead a man to embrace his dark side. The team's master plan was to turn Rockwell into a celebrity by creating a situation in which he could perform heroically, so that they could then "expose" him of some great act of wrong-doing and wreck the reputation he didn't even have before they went to work on him. Stage One of this plan was a hard trick to pull off; the self-centered creep, walking the streets sheathed in dark glasses and all-black casual ensembles from the downtown branch of Bob's Big & Tall, proved indifferent to attempted muggings and runaway baby carriages, but because Nate's people are the best, they were finally able to make it appear that he had foiled a robbery. The next step was to hook him up with an agent, impersonated by Nate, and feed his ego into the gears of an adoring captive audience by hijacking someone else's motivational speaking engagement. I don't remember Gladis ever having a scene on Mad Men, never mind Eagleheart, as tricky, or half as endearing, as his big moment here, when the surprise of hearing his every half-formed thought greeted with a round of applause strips away his jaded veneer. His silly, happy grin at the end made him seem not so much conned as reborn, and I had a thought that maybe he wasn't such a bad guy after all, and might be a candidate for reformation, like the members of Nate's merry band. Then it was revealed that, as a teenager, he'd been responsible for a car accident in which someone was killed, and that he'd used his burgeoning talents to frame an innocent man, who'd been rotting in jail for fourteen years. Can I pick 'em, or what? The news about Rockwell's foul deed must have come as a relief to both Nate and the writers, who were thus relieved of the need to flesh out the second part of their plan, the one where they would invent some way to soil his now-celebrated good name. I was relieved that, even with the sweetheart of Rockwell's fall guy filling in the expositional blanks between sniffles, the show managed to slightly deepen the tone while remaining playful and funny. Much of the credit for this has to go to Aldis Hodge, who is running off with this season without breaking a sweat. 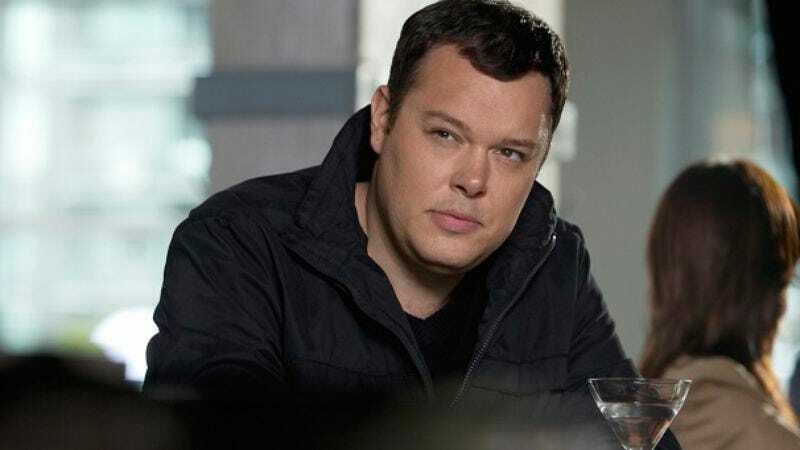 I was a little disappointed that the woman from the villain's small town past didn't reveal that, back in high school, his name was Fergus Taintface or something, and the last minute appearance by Leon Rippy as the mystery man who's had Nate's digs bugged felt a little Burn Notice-y; happy as I always am to see Tom Nuttall, I'll have to suspend judgment on that until we see where it's going. But this was the closest Leverage has come in a while to giving us one fit for the time capsule.